Most of us know who Michael W. Smith is. I thought it would be fun to read a book from him. 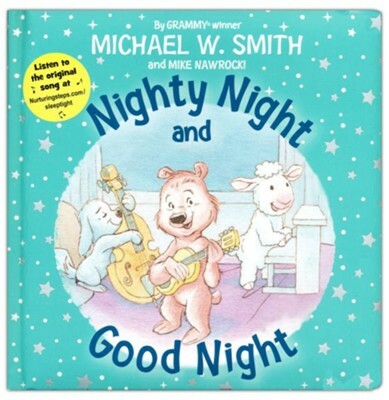 I chose to read and review Nighty Night and Good Night simply because he wrote it. The pictures in this book are pretty fun and cute. This book seems to be made for babies and toddlers. I like the overall look and feel of this book. The cover is cute, the color unique. I like the pictures in the book - they are fairly cute. I showed this book to my sister and she right away said how it didn't flow well. I think she said that it was the poorest written children's book she had seen. I have to agree with her quite a bit. This is like anything anyone would make up as they are laying beside their child at night - it's not really written well. Overall, I think that this book could have used some work before getting published. I give Nighty Night and Good Night 3 out of 5 stars.